The GVSU recording of Music for 18 dropped a few weeks ago. 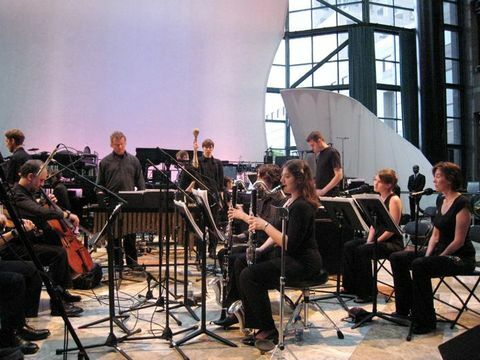 Since then there's been renewed interest in the ensemble, especially their 5 AM performance of this hourlong Steve Reich masterwork at the Bang On A Can Marathon earlier this year. A lot of people are surprised to learn that the Grand Valley State kids played for an audience of some 400 people -- "for reasons that no one could quite understand" to quote Alex Ross. It's tempting to be glib and say 'What part of 'The City That Never Sleeps' don't you understand?" On any given Saturday night in NYC, there are lots of people still out getting their fun on at 5 AM. (Obviously, it's not just NYC -- back in my callow youth, when we would hit Montreal's afterhours dance clubs, by 5 AM the party was just getting started.) When you've got close to a thousand people who came down to the Winter Garden to check out the free shows, including sets by The Books, Juana Molina, and a live version of Brian Eno's Music for Airports, it didn't seem that surprising that many of those listeners would choose to stick around for the "afterparty" (or drift in after a night on the town). The 5 AM set was planned to coincide with the rising sun -- the opening Pulses began cloaked in darkness, but by the work's end the Winter Garden's glass-enclosed atrium was flooded with daylight. (You can see the progression in the photos I took.) This experience now seems inextricable from the piece's story arc -- the maracas in Section VI will hereafter always evoke dawn for me. Music for 18 Musicians is not an easy piece, and Grand Valley State University is not exactly a magnet school for young virtuosi. The students there mostly have their sights set on teaching gigs, not whirlwind international careers. But that actually makes the piece a better fit for them, in a couple of important ways. Second, like all of Reich's music, Music for 18 Musicians is impossible to perform unless everyone involved has a highly developed sense of rhythmic authority. You need to be strong enough in your own sense of time that you can play your part securely and accurately, but you also have to be hyper-attuned to where everyone else is feeling the time, and sensitive enough to adjust your own placement to match what is happening around you. Without a conductor, a drummer, or a click track to impose the beat, it's almost inevitable that you will end up with an 18-way tug-of-war. Learning to play the piece is largely about everyone learning how to pull in the same direction. For these young musicians, being forced to take personal responsibility for the time in large group context... and then being forced to keep up that intensity of concentration for an hour or more -- this is the best, more important and relevant lesson you could possibly teach the next generation of music educators. Anyway, at this point the battle lines were clearly drawn, but we had a productive side discussion about the value of the avant-garde generally, and the merits of studying music you can't stand. I'm glad the people who were not into this music spoke up -- it's always much more fun when people say their piece instead of just gritting their teeth in silence. And I think even the skeptics found a little relief when we moved on to the comparatively lush Music for Mallet Instruments, Organ and Voices and the openly jazz-inflected New York Counterpoint. But the experience made me wonder how much grief GVSU New Music Ensemble director Bill Ryan got from his students when they learned they would be devoting the year to learning a piece that doesn't offer many of the obvious rewards most players expect when they perform music. It also got me wondering how and why the virtues of Reich's music -- propulsion, clarity, patience, audible development, complexity via the manipulation of simple materials, the gradual construction of an effective large-scale musical narrative -- do not seem to resonate with very many of my fellow jazz musicians. The jazz musicians I'm close to greatly appreciate Reich's music and its compositional (is that word?) innovations, but their own Reichian influenced work includes elements you will never hear in a Reich piece - ie. improvisation with melody, rhythm and form. Reich's music is not constructed to allow for individual creative improvisation. And I have heard second hand (I do not know this for a fact) that he is pretty hostile to any sort of improvising happening within his pieces. But let me know if there is some Reich rep that runs counter to what I'm saying. Depends what you mean by "improvisation." Most of his music contains sections of indeterminate length -- in Piano Phase, for example, the exact number of repeats (he gives a range), as well as the precise contour of the phasing sections, is up to the performers, and can and will vary from performance to performance. But clearly, it is not necessary for music to include improvisation for it to reach or influence jazz musicians. Babbitt's music contains zero improvisation but his post-Schoenberg serial techniques have been very influential in some circles of the jazz "avant-garde." "But clearly, it is not necessary for music to include improvisation for it to reach or influence jazz musicians." Right. I hope I am not giving an impression that I believe the lack of resonance you've noted among your peers regarding music is simply because they can't blow over changes! Nuts. The link I created didn't work. This should if you past it in as a URL. Sorry! Okay - feel free to delete that. If you're really curious - head over to http://www.permagrin.us/Music.htm and scroll down to the streaming track "Classical." It's a beautiful piece. I hate to be a doofus, but WHICH Radiohead tracks are you talking about? There's obviously the 5/4 beat of the opener, but that can't be Reichian (perhaps Desmondian? ha.). There's "Weird Fishes/Arpeggi" in which the 8 measures (32 beats) of drum are matched with 32 mostly triplet arpeggio guitar notes that play in a pattern of 3 (for 10 arpeggios) and 2 (for the last one), aligning to the 32 beats of the drums. But is that Reichian? I am a HUGE fan of using "Clapping Music" for pedagogical purposes! I've used it with elementary school students about 12 years ago and I'm using it now with some 11th-graders at Brooklyn International High School, where I've combined it with South Indian solkattu. One of the things I like most about using it is that it's comprehensible from the get-go, but still challenging to execute. You don't have to know anything about reading music, you can say "this symbol means clap; this symbol means don't clap. they take the same amount of time." I'm getting more resistance to learning how to practice than to the piece itself. "Weird Fishes/Arpeggi" is one of them -- the multiple asynchronous arpeggio loops are all over Reich's music. (The association is most vivid when the drums cut out at 3:03.). And the drum beat in "Videotape" is gradually stretched out using almost exactly the same process as Four Organs. "...virtues of Reich's music -- propulsion, clarity, patience, audible development, complexity via the manipulation of simple materials, the gradual construction of an effective large-scale musical narrative..."
You could be describing a LOT of composers here with this list of virtues...I think the blow back you've noted among your peers with regards to Reich's music might have to do with the fact (or opinion) that the end result of Reich's processes is a music that falls way short of any kind of transcendental experience one experiences with indigenous, ritualistic music (much of which influenced Reich and Glass). Strangely to me, Reich has removed a lot of the qualities of African music from his music that I hold dear (like improvisation). The end result for me doesn't take me anywhere as a listener and artist. So much of his rep to my ears is just dull. Maybe some other people in the jazz community who don't dig Reich could articulate their issues with this music here on your blog? I feel like my issues with Reich are valid and they don't equal a disrespect for the man (or the people who find his work inspiring). But I'd like to hear for instance exactly what some of your peers who don't get off on Reich's music have to say about it. Without being snarky, etc. but instead in a more clinical manner. Good luck with your upcoming tour by the way. I'd like to hear this new recording, but I think that nothing compares to hearing the piece live. A lot of textures and timbres arise that you can't fully appreciate on a recording. I know a fair amount of people who aren't into Reich, but check his stuff out in concert and maybe you'll have a change of heart. Also, I'm really into a lot of Afro-pop, which usually doesn't require a lot of improvising. Yet, it's so satisfying because of how things lock together and stay there. There's something to be said for fully exploring one idea - sometimes improvisers (including myself!) lose sight of that. thanks for the response! Woo hoo. I was listening to the abnormal time signature in Faust Arp (I think...) as well, and realizing that Radiohead with Johnny Greenwood is much more interesting that Thom Yorke solo. All this is on a side bar, namely that this whole post was interesting. Thanks for taking the time to respond. I'm only a listener, not a player or studier of music, and it's always nice to get a new tidbit of information.